SpaCote LP | Hawk Research Laboratories, LLC. 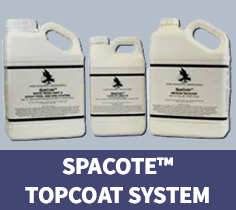 SpaCote topcoat is a premium, low-build, high-gloss epoxy coating system for use below the water line. It offers exceptional and lasting protection when compared with other spa coatings on the market. Our SpaCote topcoat is ideal for spas, hot tubs and therapy pools, as well as surfaces that have been previously painted with an epoxy coating. Note: This product is not recommended for salt water pools or salt based chlorine generating systems.